The Road to Zion. —. From the late 1840s through the 1860s, an exodus of more than 70,000 Mormons passed by here on their way to their "New Zion" in Utah. 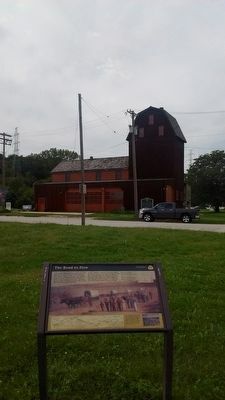 Starting from Nauvoo, Illinois in February 1846, the first group of at least 13,000 Mormons crossed into Iowa to escape religious persecution, then spent the next winter in the area of present-day Council Bluffs, Iowa and Omaha, Nebraska. In 1847, Brigham Young led an advance party of 143 men, 2 women, and 3 children along the Platte River. At Fort Bridger, Wyoming they departed from the Oregon Trail to head southwest to the Great Salt Lake. Thousands of other Mormons soon followed. Today, a marked 1,624-mile auto tour route closely parallels their historic trek. 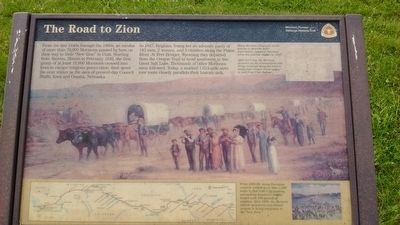 From the late 1840s through the 1860s, an exodus of more than 70,000 Mormons passed by here on their way to their "New Zion" in Utah. Starting from Nauvoo, Illinois in February 1846, the first group of at least 13,000 Mormons crossed into Iowa to escape religious persecution, then spent the next winter in the area of present-day Council Bluffs, Iowa and Omaha, Nebraska. From 1856-60, many European converts walked more than 1,200 miles to Salt Lake City pushing and pulling handcarts (right) loaded with 500 pounds of supplies After 1860, the Mormon church sponsored oxen-drawn wagons to bring emigrants to the "New Zion". The Florence Mill is in the background. 57.737′ W. Marker is in Florence, Nebraska, in Douglas County. Marker is at the intersection of McKinley Street and 30th Street, on the left when traveling east on McKinley Street. Touch for map. Marker located across from The Florence Mill. Marker is in this post office area: Omaha NE 68112, United States of America. Touch for directions. Other nearby markers. At least 8 other markers are within walking distance of this marker. The Florence Mill (within shouting distance of this marker); a different marker also named The Florence Mill (within shouting distance of this marker); The Mormon Pioneer Trail (about 400 feet away, measured in a direct line); A Meeting House for the Saints (about 400 feet away); From Indian Lands to the Golden Gate (approx. 0.4 miles away); A Little Town That Dreamed of Greatness (approx. 0.4 miles away); The Bank of Florence (approx. 0.4 miles away); Mormon Pioneer Memorial Bridge (approx. 0.4 miles away). Touch for a list and map of all markers in Florence. More. Search the internet for The Road to Zion. Credits. This page was last revised on June 16, 2016. This page originally submitted on November 10, 2015, by Tom Bosse of Jefferson City, Tennessee. This page has been viewed 298 times since then and 7 times this year. Photos: 1, 2. submitted on November 10, 2015, by Tom Bosse of Jefferson City, Tennessee. • Bill Pfingsten was the editor who published this page.